Brown Sugar Dijon Glazed Pork Loin - What's In The Pan? 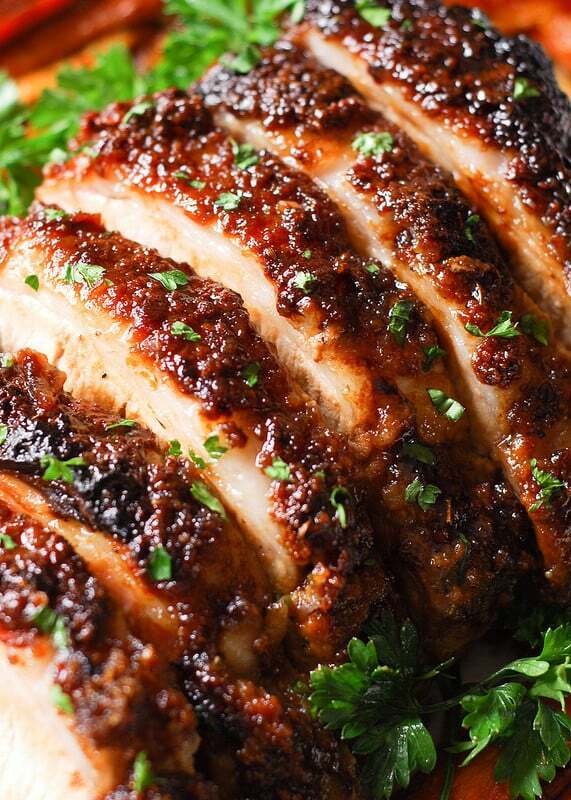 Brown Sugar Dijon Glazed Pork Loin is juicy on the inside and crusty on the outside. 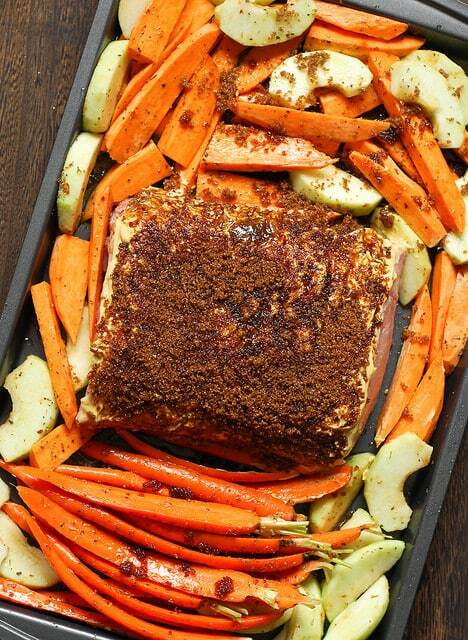 We roasted our pork together with carrots and sweet potatoes. 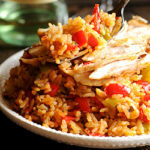 It is an excellent choice for a Holiday dinner or Sunday supper. 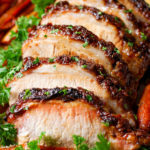 This delicious pork roast is elegant enough for Easter Sunday dinner but easy enough to make for any family gathering. 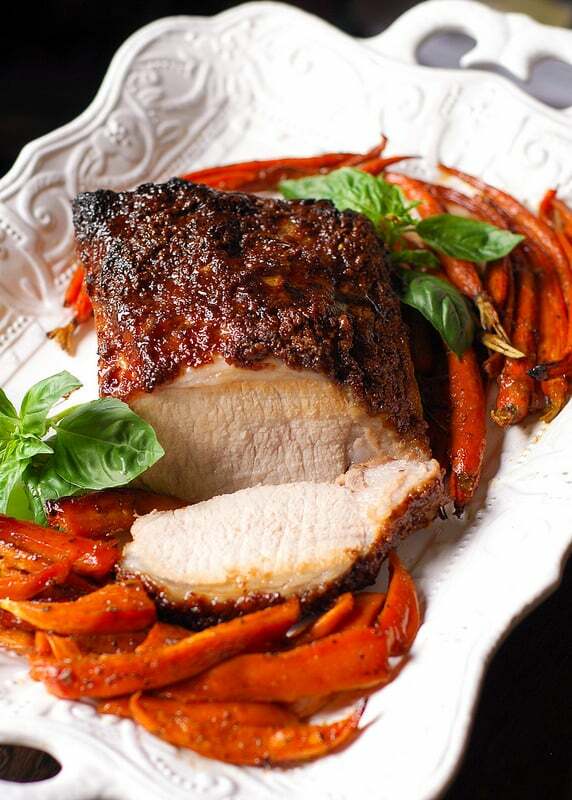 The top of the pork loin is covered in caramelized brown sugar and Dijon mustard while the carrots and potatoes create the perfect side dish. 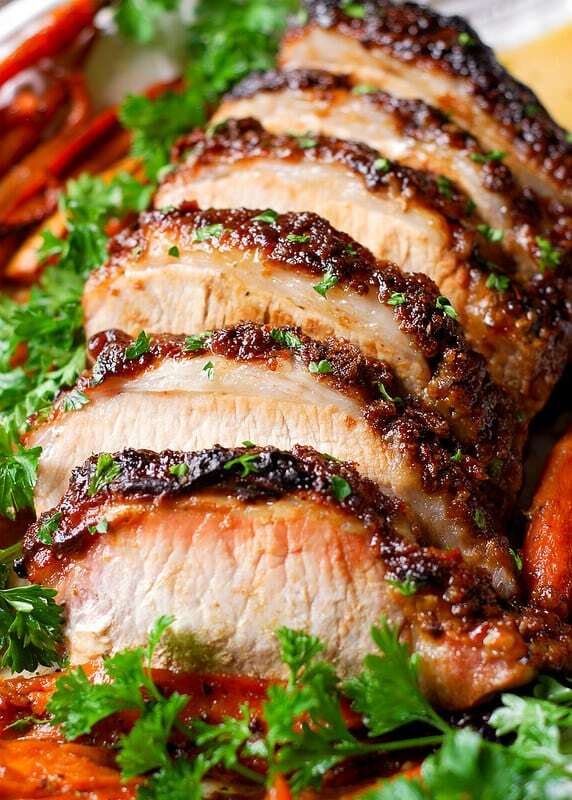 The combination of the pork roast and vegetables creates a meal that your guests will think was hard but actually incredibly easy to create. 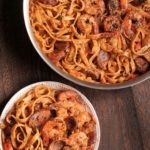 This truly is a flavorful and delicious dinner that turns out tender and is sure to be a showstopper. I used a boneless pork loin rib end and not a tenderloin. My supermarket package was 3 pounds. It came with a layer of fat on the bottom. I kept the fat on, since it provides flavor and moisture to the cooking meat. As you know pork loin without fat is very lean. 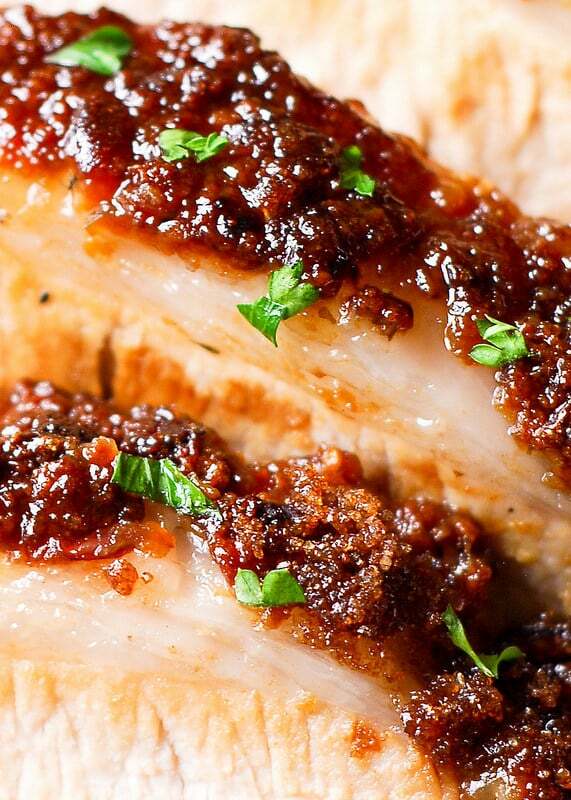 We don’t want this Brown Sugar Pork Loin to be dry. That’s why we need fat to keep the sugar glaze moist. I also like the flavor a fat cap gives to a roast. Besides, it is easier to trim it off after it’s cooked and on your plate. I also think keeping the fat on is what kept the glaze on this pork roast so nice. The dark brown sugar didn’t harden up or melted at all! Always use a meat thermometer to determine whether your brown sugar pork loin is done. It should register at 160 F for the meat to turn out white. You can also cook it until the internal temperature reaches between 145° and 160° F. At this temperature it will be a little pink inside, but still safe. 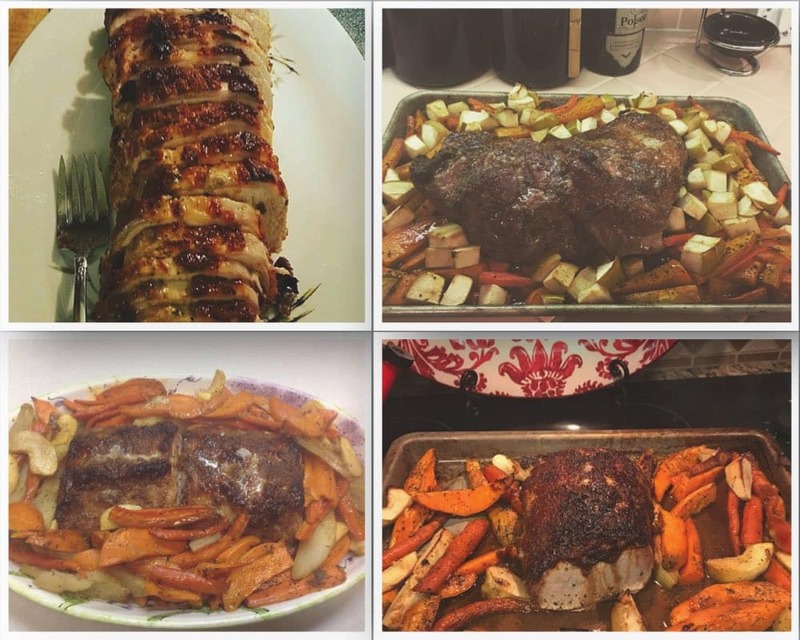 I cooked my pork roast at 375 F for 1 hour. It ends up being 20 minutes per pound. Therefore cooking time will vary depending on the size of the roast and your oven. Start checking with a meat thermometer after 50 minutes. A lot of pork loin cuts I saw are long and not too wide. Mine, for example, was short and wide! Thicker than what I wanted. Keep this in mind when cooking yours. If yours is long and thinner than mine – it will cook faster. Brown Sugar Dijon Glazed Pork Loin – pink or white? While cooking it I also realized that some people do prefer the brown sugar pork loin to be pink. Pink means 145 F on meat thermometer. And it reached that temperature after 50 minutes in my oven. I wanted mine to be white and had it in the oven a little longer until my thermometer reached 160 F. For a 3 pound pork roast you should start checking the temperature at 50 minutes in the oven as you don’t want it to be overdone. It renders absolutely beautiful brown crust for this pork loin. This brown sugar is soft and moist! It will not burn when cooked in the oven. Organic sugar is never treated with herbicides or synthetic fertilizers, or Glyphosate. On the other hand, non organic cane sugar in the US is sprayed with Glyphosate. Or, also known aso Round-up. Use of glyphosate has been proven to disrupt gut bacteria because it’s a known anti-bacterial. This in turn can lead to gluten intolerance, autoimmune diseases and development of food allergies according to Glyphosate, pathways to modern diseases. I used Maille Dijon Mustard. It’s very thick, creamy and not watery at all. Once on the pork, it will hold sugar very well. It’s available in most grocery stores at competitive prices. The link here is only for you to identify what to look for. I put my vegetables around the pork roast on the cooking sheet. If you don’t want the pork fat to go around your veggies, place the pork loin on aluminum foil with edges up to protect fat from spilling over onto other parts of the baking sheet. I didn’t mind some fat on my carrots and potatoes. Most of it stayed around pork anyways since veggies closest to the pork blocked fat from spreading further down. But using an “aluminum foil bed” under the pork to prevent liquid fat from spilling onto your veggies always works! Add brown sugar on veggies after they have been in the oven for 30 minutes. You will slice carrots and peeled sweet potatoes lengthwise. Add them to the bowl, add 2 tablespoons olive oil and mix well. Peel apples and slice them, but separate them from potatoes and carrots. Because they will be added later in cooking, after 30 minutes of oven time. This is also an optional step. 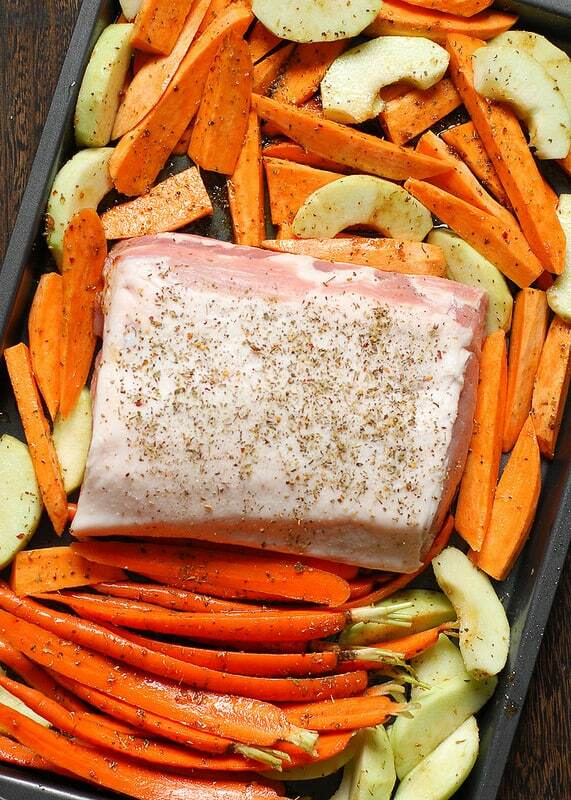 After you will place the pork loin in the middle of the baking sheet, surround it with oiled up carrots and sweet potatoes. Do not add brown sugar or apples yet. My picture shows apples, but I took them out and added them after 30 minutes in the oven. WARNING: If you put the apples early on, they will turn into the mush. Add spices evenly over vegetables and pork loin. I used sea salt, black pepper and Italian seasoning (optional). 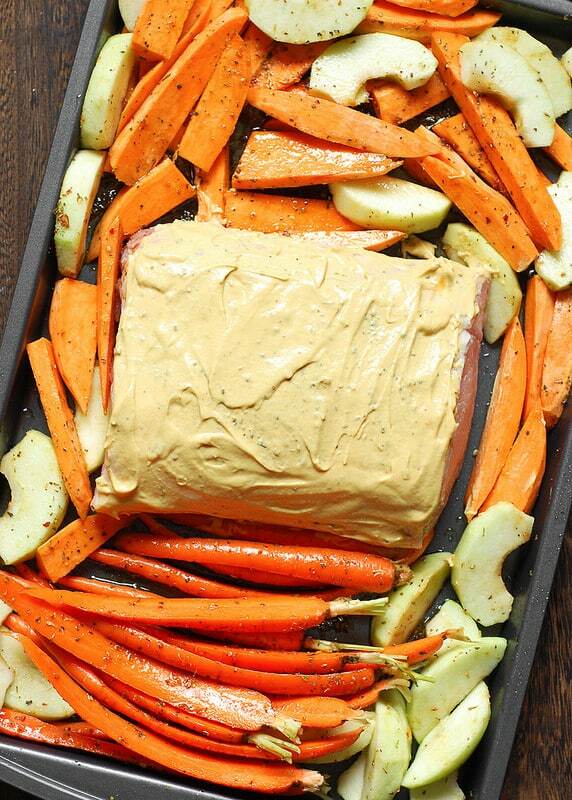 Generously brush the entire surface of the roast (except bottom) with Dijon mustard. I used 3 tablespoons. If your pork loin is smaller, use less. Press 1/2 cup of dark brown sugar into the mustard, all over the roast. Please read the section above on what kind of sugar to use in order to achieve the beautiful crust. I also sprinkled very little around the veggies. Sprinkling the veggies is optional step. Roast at 375 degrees F.
Take the pork loin out after 30 minutes. Add sliced apples and sprinkle with brown sugar over the veggies. Return the roast to the oven and continue cooking until the internal temperature of the roast hits between 145 (pink roast) to 160 degrees F (white roast) on a meat thermometer. Bake this pork loin for 50 minutes at least. I baked mine for 1 hour. Let the roast rest for 10 minutes before carving and serving. A reader reported that the sugar melted in the oven before the pork loin was done. It depends on the type of sugar. The more processed the sugar is, the easier it is for sugar to melt. It’s very important to use dark brown sugar here. Dark brown sugar contains molasses that inhibits the sugar from dissolving too quickly. 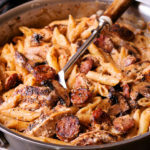 Make sure that you press dark brown sugar firmly into creamy Dijon mustard. The mustard serves as a glue keeping the sugar tightly in place. Ensure that you have a fat layer on top of the pork loin. This will keep the sugar in place. 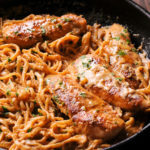 If you experienced issues making this recipe, please consider leaving a comment so that I can update this section and try to figure out what went wrong. Or, if everything went well, let me know too! This delicious oven roasted pork loin can become a perfect centerpiece of your Christmas or Thanksgiving table and leftovers can be used in sandwiches and casseroles! Cut carrots and sweet potatoes lengthwise. Add them to the bowl, add 2 tablespoons olive oil and mix well. Slice peeled apples – but place them in a different bowl to be added later (optional step). Place pork loin with fat layer on top in the middle of the baking sheet. Surround it with oiled up carrots and sweet potatoes. Do not add brown sugar or apples yet. My picture shows apples, but I took them out of the pan and added them after 30 minutes in the oven. Season the pork loin and vegetables with spices evenly: 1 tsp sea salt, 1/2 tsp black pepper, 1 tsp Italian seasoning (optional). Generously brush the entire surface of the pork loin (except bottom) with Dijon mustard - 3 tablespoons. If your pork loin is smaller, use less. Press ½ cup of dark brown sugar into the mustard, all over the roast. Place the baking sheet in the oven and cook at 375 degrees F. Take it out after 30 minutes and sprinkle the veggies with 1/3 cup of brown sugar. Adding apples (optional step): Add sliced apples at this point. Return the roast to the oven and continue cooking for about 20-30 more minutes or until the internal temperature hits between 145 (pink roast) to 155 degrees F (white roast) on a meat thermometer. The total cooking time for the roast of this size ends up being 50 minutes to 1 hour and that does not include resting time of 10 minutes! See below. Important! Keep in mind that large cuts like this pork loin increase in temperature approximately 10° F. while resting. Which means that if you are aiming for 160 F, remove them from the heat at 150° F. followed by a 10 minute rest. Let the roast rest for 10 minutes before carving and serving. Once again, remove it prior to desired target temperature to avoid the pork drying out. The pork will continue "cooking" while resting. This will also allow the juices in the meat to settle down and stay in the meat when you slice it. I’m not a lover of Dijon…does the sugar help with that or could I sub with something? 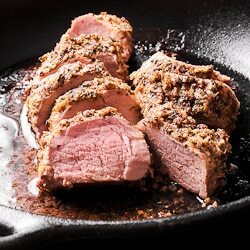 How about garlic and brown sugar combination, like in this Pork Tenderloin recipe? Came out great! New family favorite! Wonderful recipe. I followed it to the letter! I have pictures on Pinterest, not sure how to post them here.